| FRENCH INSPIRED | to me, this outfit is comprised of all of the components that I would expect to see in a French woman’s closet. 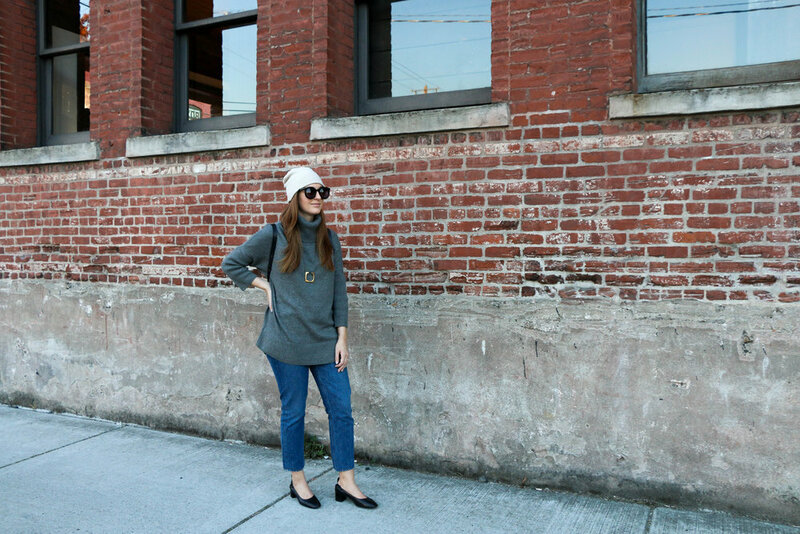 A simple turtleneck, chic straight leg jeans, a basic black heel and an urban backpack. I’ve made it slightly my own by adding a beanie (one of my favorite fall accessories) and my go to statement necklace. Overall it’s a pretty basic outfit but sometimes it’s nice to venture back to basics! | REMOVABLE TURTLENECK | talking about this sweater one more time :) this time it’s a turtleneck! I was hesitant at first with the idea of a removable turtleneck. I thought that the buttons might make it sit weird or that it would be a terrible hassle. The buttons did take a little bit of getting used to when reattaching the turtleneck but really it’s a small price to pay for an item that is as versatile as this one! | COOL TONES | my 10x10 has definitely been divided into warm and cold looks this go around. I have never really put much thought into warm or cool tones but I’m trying to be more mindful of it in my looks. Especially as I try to nail down my favorite colors for each season! This look is definitely on the cooler side and I love how it contrasts with my red hair! | ELEVATING DETAILS | I love focusing on the details of an outfit and how small tweaks can elevate a look. For this look what sets it apart from a basic look in my mind is the beanie, backpack, jean cut & drop shoulder sleeves. Accessories are easier to work with when you want to elevate a look. But when it comes to the actual garments that can be tricky. I find that if I’m looking for a piece that will add a little summin summin to my outfit I start with a basic garment. For example let’s take the jeans in this outfit. I wear/wore skinny jeans all of the time. I also wear crop cuts all of the time so investing in a slim straight leg with a crop was an easy decision for me. It’s just a combination of two things I already love!